B&K Timber make bespoke wooden garden gates in a variety of styles to suit all homes and budgets. Create a great first impression as visitors enter your garden with a made to measure beautiful timber gate. 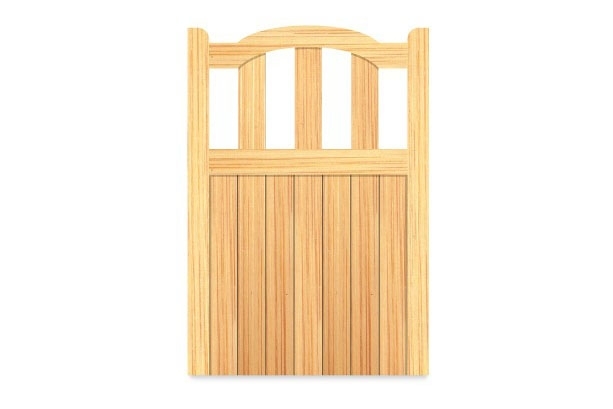 B&K Timber have twelve different styles of wooden garden gates to choose from. Starting with the models of the Garden Straight Top Economy Gate and the Garden Shaped Top Economy Gate these no frills options give great security with quality timber and classic styling to suit any garden. The top end of the range include models like the The Woodland Gate which gives a grand feel to any garden with its beautiful convex curve in the centre. Alternatively, the Westport model of wooden garden gates is charming with its concave shape and wooden pales. See the range of wooden garden gates available from B&K Timber. It is easy to order your bespoke gates online by using our gate builder. We make gates from PEFC and FSC certified timber using the highest quality sustainable Scandinavian Slow Grown, Joinery Graded redwood timber. Our gates are made to last gaining their strength by using traditional mortise and tenon joints. Wooden garden gates are treated in a choice of three spirit based preservatives for longevity in all weather conditions. We have 30 years’ experience of making gates in our Staffordshire based workshops. Skilled craftsmen make wooden garden gates which are made to measure with the aim of enhancing your home and garden. With free delivery on gates to mainland UK addresses we believe that all of our customers should have the chance to own a set of special handmade gates. If you have any questions about our wooden garden gates then please contact us.